Check KHMER WOO's homework. If you find any of his answers are wrong please write down a sentence or two explaining what he did wrong. It is a very good starter. But I think the answer to the question 11 is correct. The answer to 11 is mathematical correct, but with the unit £ it should have two decimal places? Question 8 is an equation in "x". Nothing says that it is intended to be an identity which has been incorrectly simplified. Why not just "solve for x". If this Starter generates discussion then it has been worthwhile. 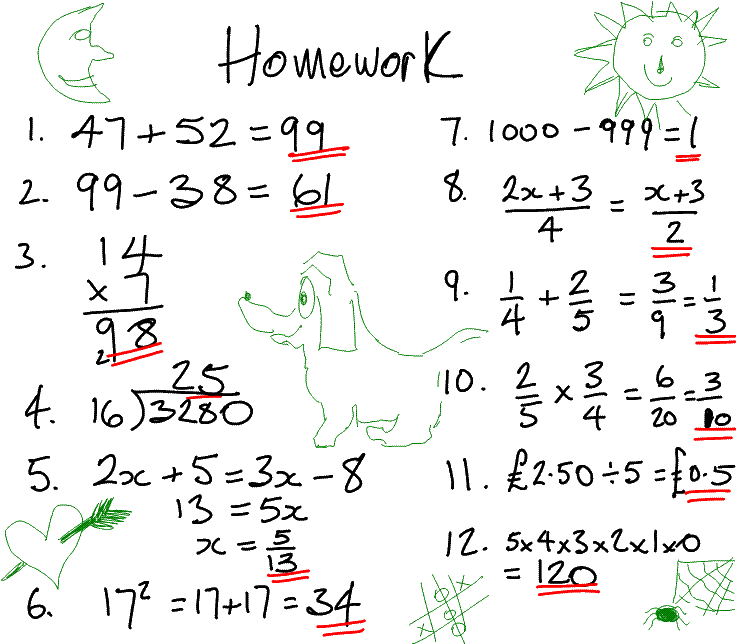 Looking at someone else's work is probably a novelty for most students and requires them to think in a different way from the thought processes that normally go into completing Maths homework. The mixture of question types provides a quick revision of many algebraic techniques should be familiar to students working their way through Secondary school. This starter has scored a mean of 3.1 out of 5 based on 383 votes. Here is the URL which will take them to a mixed student activity. Look back at the work you have done in your exercise book or on your computer. Find all of the mistakes you have made. Create a page like the one above containing your mistakes and some correct calculations. Email it to another student to mark.